Today, Sunday 5th October I ran in The 32nd Great Cumbrian Run which is a Half Marathon in Carlisle. I have been suffering with a bad chest and cough for the past couple of weeks, and despite my cough being slightly better I didn't feel on top form to run a good half marathon. However, I had already deferred this race from last year due to my ankle injury so I was determined to run it this year despite not feeling 100%. I went with the view that I would run for fun and not stress about a time. My aim today was to get to the end still being able to breathe! I was rudely awakened by my alarm at 7am. I was pleased to see that it was a fine morning as the weather forecast in the preceding days kept alternating between a cloudy day and heavy rain! I managed to have my usual pre-race bowl of porridge and a banana before we left our home town of Kendal at 7.55am for the 48 mile journey up to Carlisle. The weather taunted me all the way as we kept driving through "pockets" of heavy showers! 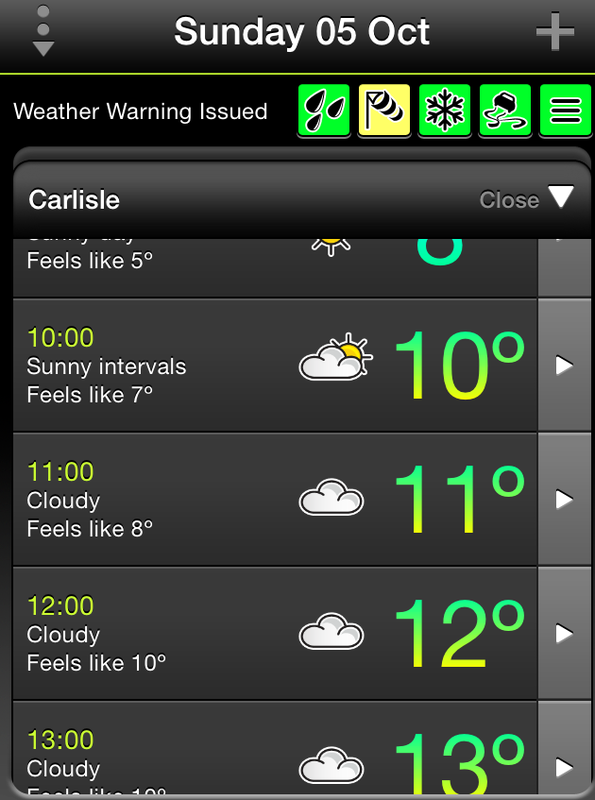 I had no idea what weather to expect in Carlisle! 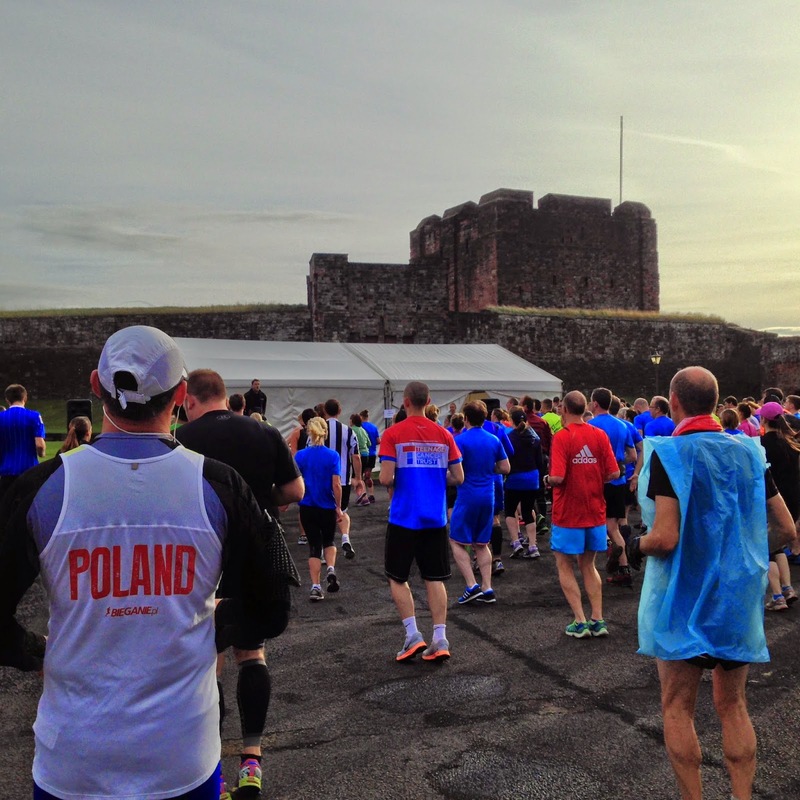 The race didn't start until 10am but you had to pick up race numbers and timing chips at Carlisle Castle before 9.15am. We were greeted by fine cloudy weather when we arrived in Carlisle at around 8.50am and got parked easily on the street opposite the Castle. We had a swift walk from the car under the bypass to the castle arriving to collect my number in plenty of time at around 9am. We headed back to the car to keep warm as it was an extremely chilly morning! Once in the car I attached my race number and fumbled around trying to securely attach my timing chip to my laces! I arrived in the forecourt just in time to visit the facilities before the warm up started! I thoroughly enjoyed the warm-up and actually felt warm afterwards - a small miracle considering how chilly it was! At around 9.50am they called for the fast runners to head to the start line asking for people with predicted finish times of between 1 hour and 1 hour 20 minutes. The next group called were those finishing between 1 hour 20 and 1 hour 30, then 1 hour 30 and 1 hour 40! I had been about to wait for the next zone to be announced but when I looked around me I realised there was hardly anybody left so I headed to the start with this batch! By this time any benefit of the warm-up had gone and I was shivering as I approached the start! I felt highly irritated that my first mile was hampered by having to weave in and out of very slow runners and even walkers - why on earth did they feel the need to start in the faster zones and cause such congestion! I spent all my teenage years growing up in Carlisle so this run felt like a trip down memory lane! We started off from the magnificent Carlisle Castle, crossing Castle Way and heading through Carlisle city centre. I found it highly amusing to be running down Botchergate which was partially closed to traffic when I am used to staggering down it in high heels! After running about 2.75 miles through the city and the suburbs we headed out into the countryside and through the picturesque villages of Cumwhinton, Wetheral and Scotby. I recognised the village hall in Cumwhinton where I used to go to Brownies (many moons ago! ), and passed where I got married in Wetheral! I found it strange and slightly dangerous that the roads appeared to be partially closed with runners on one side and traffic on the other, but no thought had gone into what would happen if the traffic wanted to turn off crossing the path of the runners. I witnessed several near misses where impatient cars just drove at a pack of runners! I think the turn-offs should have been closed to stop this dangerous practise! There was also a man running with a baby in a buggy. Surely this isn't acceptable practise either in a Half Marathon as he was causing congestion and I struggled to pass him! Anyhow, they are my only 2 gripes with regards to this race and the support going through the villages was amazing - especially in Wetheral, where I think the entire village must have come out in force to create an amazing atmosphere. There were water stations serving bottled water with the added bonus of having sports caps every 3 or 4 miles which was great! At around the 9 mile mark we started heading back towards the city and through the suburbs again before turning into Rickerby Park for a very enjoyable run through the fallen leaves! ! Once leaving Rickerby Park there was a great downhill road section before we entered Bitts Park and headed towards The Sheepmount Athletics Stadium. It was a little tricky underfoot as there was masses of conkers on the ground but this just added great variety to the route! Before I knew it I was running on the athletics track heading towards the finish line! I crossed the line and was pleased to see that when I stopped my Garmin it showed a finish time of 1:56:50. Not bad considering I had been coughing and spluttering my way round! Just over the finish line a very friendly lady helped me remove my timing chip, and I was then handed a medal and goody bag! All in all a fabulous race that I would definitely do again and would highly recommend! Very well organised and ran smoothly! To top it off we also got bling as well as a T Shirt! I just wish other runners would respect what the organisers are trying to do to avoid congestion and start in the correct time for there ability! You can view the route here!